The Acura TLX is a compact executive / entry-level luxury sedan manufactured by Acura, the luxury vehicle division of Honda, since 2014. The Acura TLX was first shown as the "TLX Prototype", a sedan designed in Acura's Los Angeles Design Studio, as a replacement of the TL and TSX sedans. The production version was unveiled in April at the 2014 New York International Auto Show. Sales began in August, the TLX entered production during July at Marysville, Ohio, United States. Two powertrain options are available. A 2.4-liter four-cylinder DOHC i-VTEC engine is available with direct injection mated to a dual-clutch transmission and Motion-Adaptive Electronic Power Steering, Precision All-Wheel Steer (P-AWS) through Integrated Dynamics System. The Honda designed dual clutch transmission is the first to use a torque converter, this is done to absorb transmission gear shift shock reducing NVH. The engine is rated at 206 hp (154 kW) with an EPA-estimated fuel economy of 24/35/28 mpg (city/highway/combined) compared to 22/31/26 from the previous TSX. Honda estimates that the six-cylinder model is 1.5 seconds faster from 0 to 60 mph. The four-cylinder TLX started at $31,890 or $360 more than the retiring TSX. A 3.5-liter direct injected SOHC VTEC V-6 with cylinder deactivation (VCM) is mated to Honda's first time use of a 9-speed automatic transmission (sourced from ZF), it's available with either P-AWS or all-wheel drive (SH-AWD). The SH-AWD system uses hydraulic clutches instead of the electromagnetic clutch packs found on the previous TL which significantly cuts weight, size and cost. The engine is rated at 290 hp (216 kW) and front-wheel drive models deliver 21/34/25 mpg while all-wheel drive models are rated at 21/31/25 mpg. The V6 TLX will start at $36,115 or $810 less than the outgoing TL, SH-AWD models will come standard with the "Technology Package" costing $1,860 less than the previous SH-AWD TL equipped with the "Technology Package". TLX models configured with the V6 engine will lose nearly 150 lb (68 kg) compared to the FWD TL and over 225 lb (102 kg) compared to the SH-AWD TL. The SH-AWD model is no longer offered with high-performance summer tires rather less sticky all-season tires. Like the RLX and MDX, the TLX comes standard with LED headlamps, also amber LED turn signal indicators incorporated into the side mirrors and rear LED brake lamps. Overall length compared to the previous TL was reduced by 3.8 inches (97 mm) while the wheelbase maintains the same length. As with the 9th generation Accord, the TLX loses the front double wishbone suspension of the TSX and TL replacing it with a MacPherson strut arrangement. To significantly cut down on interior noise, triple door seals are used as well as additional sound insulation. Acura unveiled the revised 2018 TLX in April 2017. Notable changes include revised front fascia, fenders, and grille; restyled wheels; and new infotainment features including Apple CarPlay and Android Auto support. Additionally, a new 'A-Spec' performance trim has been added. US sales began during June 2017. In April 2017 a long-wheelbase version specifically developed for the Chinese market was announced. It debuted in August 2017, at the Chengdu Motor Show, and is called the Acura TLX-L. The TLX-L is only offered with the 2.4-liter four, producing 153 kW (208 PS). Features Lane Keeping Assist System with Road Departure Mitigation System, Adaptive Cruise Control with Low-Speed Follow, Blind Spot Information System, Tire Pressure Monitoring system with Tire Fill Assist, Collision Mitigation Braking System, Vehicle Stability Assist. 7 airbags, including driver's knee airbag. 1 vehicle structure also rated "Acceptable"
The second generation of the TLX is slated to be released in 2019 for the 2020 model year. Acura confirmed that a Type S will be offered. A TLX-GT, a race car version of the TLX SH-AWD with a twin turbo version of the direct injection V6 engine found in the production TLX SH-AWD sedan has also been developed by the Acura Motorsports Group at Honda Performance Development. This has a modified chassis and aerodynamic performance parts approved for Pirelli World Challenge competition. The TLX-GT was unveiled at the 2014 North American International Auto Show. RealTime Racing entered a factory-backed car in the GT class at the Mid-Ohio and Sonoma rounds of the 2014 Pirelli World Challenge, with Peter Cunningham claiming a best result of 13th. In 2015 the team fielded two full-time entries for Cunningham and Ryan Eversley. The latter won the first St. Petersburg race and finished sixth in the GT class drivers classification, whereas Cunningham ended 14th. Eversley continued as full-time driver in 2016, winning the two Road America races. Cunningham raced the first half of the season, claiming a runner-up finish at Road America race 1, then Spencer Pumpelly took his place for the last three rounds. The TLX-GT was replaced by the Acura NSX GT3 in 2017. ^ a b c d "TLX-L: 技术参数" [TLX-L: Technical Specifications]. Acura 讴歌移动网站 [Acura Mobile Website] (in Chinese). M.acura.com.cn. Retrieved 2018-08-30. ^ "Video: Walkaround with Acura TLX Lead Designer Jared Hall". ^ a b "Battle between compact executive cars Acura TLX to Audi A4". ^ a b "Size of Acura TLX". ^ a b "car ranking list of compact executive cars". ^ "Car Shopping Guides". J.D. Power. Retrieved 2018-08-30. ^ Barry, Keith (2014-01-14). "Acura shows replacement for TSX and TL sedans". USA Today. Gannett Satellite Information Network, LLC. Retrieved 2018-08-30. ^ Elmer, Stephen (2014-04-16). 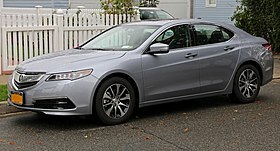 "2015 Acura TLX Revealed in NY as TL, TSX Replacement » AutoGuide.com News". Autoguide.com. Retrieved 2018-08-30. ^ "2015 Acura TLX". Motor Trend Magazine. 4 August 2014. Retrieved 14 July 2015. ^ James R. Healey, (9 August 2014). "Test Drive: Smooth, quick Acura TLX is spot-on". USA TODAY. Retrieved 14 July 2015. ^ Karl Brauer. "Will the All-New 2015 TLX Solve Acura's Sedan Woes?". Forbes. Retrieved 14 July 2015. ^ "Production Acura TLX-L Unveiled". Acura Connected. 2017-08-19. Archived from the original on 2017-09-10. ^ "Vehicle details". Retrieved 14 July 2015. ^ "2015 Acura TLX 4 DR FWD". Retrieved 14 July 2015. ^ "2015 Acura TLX 4 DR AWD". Retrieved 14 July 2015. ^ carengineinfo. "2020 Acura TLX Redesign, Specs, And Price – Cars Specs Info". Carengineinfo.com. Retrieved 2018-08-30. ^ Acoba, Paulo (2018-01-16). "2020 Acura TLX Type S SH-AWD will be the best Acura sedan ever - Alt Car news". Alt Car news. Retrieved 2018-06-12. ^ "2020 Acura TLX Engine Updates". Autospix. 2019-04-20. Retrieved 2019-04-21. ^ Chris Paukert. "Acura TLX GT Racecar bringing the 'X factor' to Pirelli World Challenge". Autoblog. Retrieved 14 July 2015. ^ "Honda Division Breaks Annual Auto Sales Record as Honda and Acura Brands Set Numerous New Sales Marks". Honda Newsroom. Retrieved 14 July 2015. ^ "American Honda Sets New All-Time Annual Sales Record". Honda News. 2016-01-05. Retrieved 2018-08-30. ^ by AcuraConnected (2017-01-04). "Acura USA December 2016 Sales Report – Acura Connected". Acuraconnected.com. Retrieved 2018-08-30. ^ Name * (2017-12-30). "Acura TLX US car sales figures". Carsalesbase.com. Retrieved 2018-08-30. ^ Name * (2017-12-30). "Acura TLX US car sales figures". Retrieved 2018-08-30. This page was last edited on 22 April 2019, at 10:13 (UTC).